Welcome to the Zva Creative April Blog Hop! If you arrived here from Natasha's Blog, you are in the right place, if not you might want to start at Zva Creative Facebook Page, so that you don't miss any of the designers beautiful creations. Hidden along the hop are FIVE Zva Creative prize packages, so it's important to leave a comment on as many blogs as you can along the way. Winners will be randomly chosen after the hop is over. I went more of the CAS route with my card, using papers from MME and stamps from Our Daily Bread Designs. I stamped Our Daily Bread Designs Romantic Floral Designs image in Black Archival on White card stock, then die cut using Spellbinders Labels Twenty-Six. The quote is from ODBD's Morning Glory stamp set. The die cut panel is layered on a Black Panel die cut with Spellbinders Labels Twenty-Two. 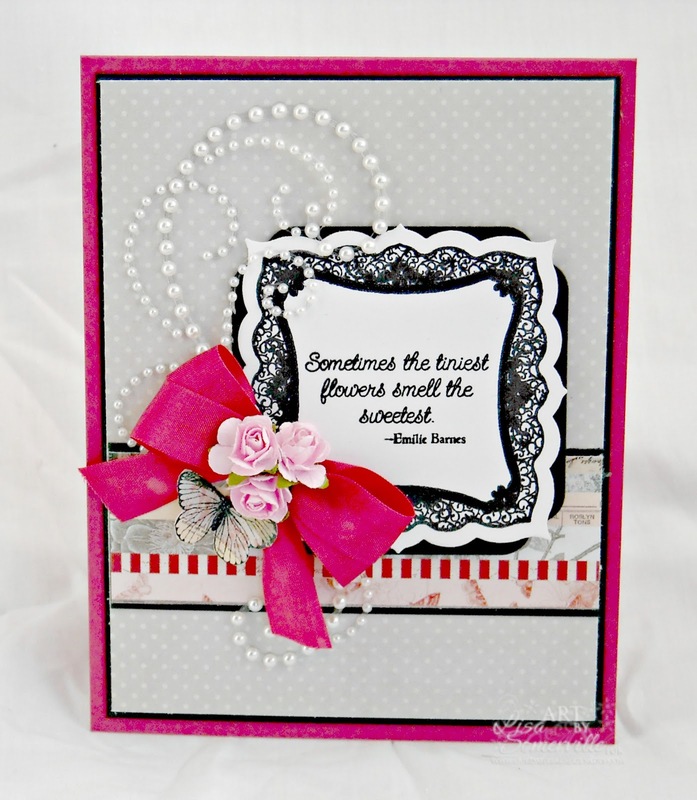 To embellish my card, I added Zva Creative White Pearls (CR-06CA-112), Pink Mini Roses, Rose Seam Binding Double Bow, and a butterfly from one of Our Daily Bread Designs new Stamped by Mini Sets that is being released on May 1st. The Blog Hop runs through 11:59 EDT on Tuesday, April 30th. Be sure to check back on Wednesday, May 1st, to see if you are one of the lucky Zva Creative Prize Package winners! The winners will be announced on the Zva Creative Facebook Page. Thanks so much for stopping by, your next stop is Julie Ranae's Blog! Our Next DT Blog Hop will be on Monday, May 27th! Love the bold pop of color and how the ZVA flourish just makes this pop as well. Lovely card. Bling says it all! HI this is sooo cute, just love it. 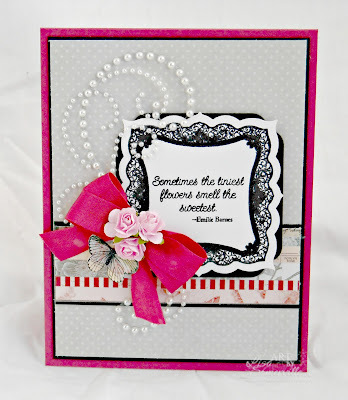 What a lovely card design, and those Zva pearls just take it to the next "wow" level ! Great card. Good use of the ZVA flourish! Thanks so much! Pink and black always a great color combo. Truly lovely card. Delightful artwork Lisa! Looks like a breath of springtime! beautiful card and great colours together! Your card is a true beauty! Love it! Beautiful, elegant, classy and gorgeous! What a beautiful card! Love the color combo and of course the bling! Gorgeous...it reminds me of that perfect little black dress with a dash of pink! Very sophisticated! So pretty!! Love the pop of color! TFS! Lovely card--I like the colors and the flourish. I love how the white bling pops with the pink and grey. Beautiful! Beautiful card!! Love the bling! The pearl florishes are classic. Love your project. Wow! Adorable card! "Happy Spring"
I tweeted about the bog hop.... https://twitter.com/DebraJLovell "Happy Spring"
I posted on my face book page about the Hpo! "Happy Spring"
I asked Hobby Lobby to carry more Zva products! "Happy Spring"